The New Shingles Vaccine Is HERE! Shingrix� prevented shingles outbreaks in 97% of patients 50 years of age and older! Call your pharmacist today at 321-5330. Want even FASTER service? Fill out your screening form found HERE and bring it in with you! "Flu" is short for influenza, a contagious respiratory illness that infects the nose, throat and lungs. Severe cases can even lead to death. Best way to prevent the flu? Get an annual flu shot. The flu season usually starts around mid-August and runs through the end of March with the peak being November through February, however the virus can stay active year-round. Is the flu virus contagious? Very! You can have the flu for 1 to 4 days before you start feeling sick. This means that you may be able to infect someone else before you even know you have the flu, not just while you are feeling symptoms. What does it mean when you hear that "the virus has mutated?" While the flu is going around, the virus can change and create a new flu strain. When this happens, the vaccine being given during that flu season may not provide enough protection against the new strain. This is one way that flu outbreaks can happen. When should I get my flu vaccine? The vaccine provides protection starting two weeks after you receive it. The Centers for Disease Control (CDC) recommends getting vaccinated every year as soon as you can. 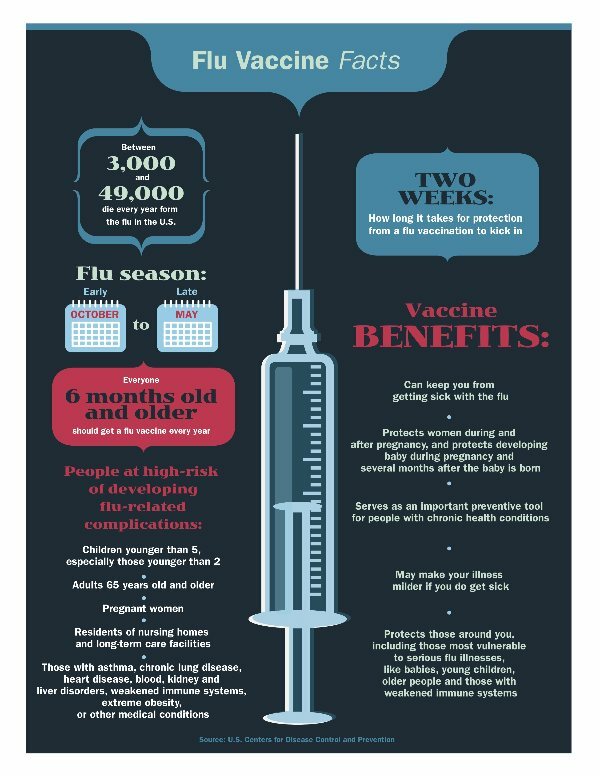 The CDC recommends a universal influenza vaccination every year for everyone 6 months old and older. TrueCare offers vaccinations for those 6 and over. Who should NOT get vaccinated or should wait? What are the side effects of being vaccinated? If you feel any of these side effects, don't worry. You should feel better within 1 to 2 days. I got my flu shot and I still got sick with the flu. Why? It takes 2 weeks to get full protection against the influenza strains in your vaccine. There is a chance you could get sick within those 2 weeks if you are exposed to a strain different than the one you received. Is one flu vaccine recommended over another? For the 2016-2017 flu season, the Advisory Committee on Immunization Practices (ACIP) recommends annual influenza vaccination for everyone 6 months and older with either the inactivated influenza vaccine (IIV) or the recombinant influenza vaccine (RIV). The nasal spray flu vaccine (live attenuated influenza vaccine or LAIV) should not be used.There is no preference for one vaccine over another among the recommended, approved injectable influenza vaccines. There are many vaccine options to choose from, but the most important thing is for all people 6 months and older to get a flu vaccine every year. Contact one of our pharmacists to find out which vaccination is right for you. Is there a difference between the flu vaccine that I get at my doctor's office vs. TrueCare Pharmacy? Manufacturers create over 156 million flu vaccine doses per season and distribute them across the U.S. Manufacturers send the same vaccine to pharmacies (including TrueCare) and other vaccine providers. What is the difference between available flu vaccines? The CDC doesn't recommend one vaccine over another. The important thing is to get vaccinated as soon as possible. Contact one of our pharmacists to find out which vaccination is right for you. Download our FREE prescription refill app!